Secret Golf's Steve Elkington visits our resident cartoonist, Calder Chism, in Reno, Nevada and has fun playing golf with the boys at Washoe Golf Course. [MUSIC PLAYING] NARRATOR: On this episode of "Secret Golf," we double down in Reno. STEVE ELKINGTON: The perception of Reno is cowboys used to come in on their horses and pull in, take off their Stetson, and go in and do a little gambling, drinking, and fighting. 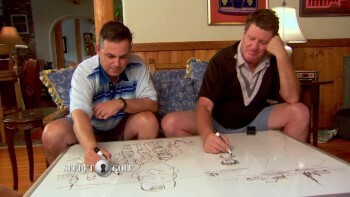 STEVE ELKINGTON: You and I have worked together on 'toons for five years. We're going to show people how we do it. Everyone loves our 'toons. NARRATOR: And hit the links with his group of choppers. -You guys pretty much represent the golf in Americana landscape here of averageness. THEME SONG: It's "Secret Golf." That's what I'm moving for. -That's what puts the curve on it. THEME SONG: That's why I get up every morning, call my good-timin' friends. Keeps me coming back for more. "Secret Golf," we're headed down the road. We just love filling up the Big Show, it's going looking for the heart of the storm. THEME SONG: Rolling till the wheels fall off, it's "Secret Golf." Shhh, it's a secret. STEVE ELKINGTON: Reno is a old-school field town. Perception of Reno is train goes down the middle of the old casino area, and cowboys used to come in on their horses and pull in, take off their Stetson, and go in and do a little gambling, drinking, and fighting. That was Reno. CALDER CHISM: It was sort of a Vegas before Vegas was Vegas back in the '40s and '50s. Nowadays, people who don't know about this city can come here and find out that it, it's kind of, I think, it's a sneaky, cool town. STEVE ELKINGTON: It's even got the sign, right? The smallest, biggest town in America. CALDER CHISM: I'm the fifth generation. My kids are the sixth. We've been here forever. There's plaques on bridges down there that have my family's name on them. There's a lot of history here and no real compunction to go somewhere else. NARRATOR: Dealt a hand of mispronounced locations, the Reno-ites get some house money on the range. STEVE ELKINGTON: So we're at the 'Shoe in Ne-vah-da. -We thought we would come out and see Calder, 'toon master. Is this a country club or golf club? CALDER CHISM: This is a golf course. STEVE ELKINGTON: What every guy who plays golf in America, or girl, they have their group. And this show is about their love for golf and how much love they have for one another. CALDER CHISM: This is my local group. We got all these different guys-- the Professor, the Mechanic, got El Gato, T-Money. When people address me, it usually ends up just being "C." Elk calls me C, Big Crayon. CALDER CHISM: I like the Big Crayon. STEVE ELKINGTON: And they just have a ball here at this course-- Washoe Golf Club. It's not a country club. Golf club. Public track. Our goal on our show, a lot of times, is we want to make it a little different. With the cartoons, the animation, it really is a unique perspective, because we do think about our golf and about what we try to entertain people, a little differently than mainstream. It's definitely a gift because hardly anyone can draw. You know, they're few and far between. And I'm amazed at Calder's drawing, to be honest with you. He's spectacular. CALDER CHISM: My dad is a fine artist. When I was a kid, I used to watch him down in his basement doing sketches of very realistic illustrations. After college, I drew editorial cartoons for both local papers here. And then Moscow-Pullman bring-- got them, published and got one in the "New York Times." Got them in the "Washington Post," "USA Today." And then when I met Elk in 2006, I was introduced to him as a cartoonist. He draws. He's a cartoonist. And Elk says, really, I'm a cartoonist too, mate. And that was it. STEVE ELKINGTON: He draws straight off of his memory. To me, is the most purest form of gift that you can get for a drawer. -It's not only the talent drawing. It's the wit and the thought behind it. He can put two things together and come up with something pretty comical. And then you bring in Elk's side of it and all the experience that Elk has had, and you put those into a brew, and you see the 'tooning that comes out which is pretty funny. STEVE ELKINGTON: It's amazing that Calder told me if I didn't hire him five years ago to be a cartoonist for us, he might not have ever done cartooning again. To me, it's just-- it's mind-blowing to me. CALDER CHISM: Elk likes to say this is what I would do if I wasn't a golfer. And I think that's great. You know, I'd like to say, if I wasn't a cartoonist, I'd like to be a really good golfer with a cool accent. NARRATOR: Reno conjures up visions of life's characters playing hard. So it's only appropriate that "Secret Golf" meets the town's cunning mistress. CALDER CHISM: Washoe Golf Course-- it's an old golf course. It's been here since the '40s. Nicknamed the 'Shoe. Me and my boys have many other nicknames for it. One of them's "the cruel, old lady." -Those guys love this place. They even have a mystical woman, an old lady that is the caretaker of this property. Oh, let's see what the old lady's going to give us today. And don't upset the old lady. -It's almost become a running joke that every time we come out here, she does something to us that reminds us who's in charge. You just walked off with a trip. One said, cruel lady, what did I do? How can I get back on your good side? Please. -It's our county golf course, and it's a treasure. I'd rather play here than a lot of other places just because of all the little nuances of the small greens and having to navigate your way around here. And then the nostalgia of this is where we grew up. DARIN MENANTE: With our small greens, that's what makes this course tough. It's not a long course, but when people miss the green, they short-side themselves. So they go, oh, my god, I have this chip. They don't have it. That's what's tough about this course. STEVE ELKINGTON: They have become immune to being fearful of chipping, because if you come to the 'Shoe, you're going to be almost chipping every hole. You hear this shot a lot about knock-down shot. What is it? What's a knockdown shot? This is my normal stance for a seven iron. I've got a seven iron here. If I stood one inch closer to that ball, for me to hit that ball in the sweet spot, I would have to pull in on it a little bit, and my ha-- my hands would have to be way further lean. I measure off my regular. And I just creep in on it a little bit. So now, I've got a-- now, I've got a shot with the same swing as my big swing, but I'm going to have more forward lean on the shot. If you have your real swing and you're a little bit closer, and you're going to have more lean which is going to be low, then you don't have any stress. That's really low, right? For a seven iron. It's not dangerous because people-- you, you think, well, there's my regular. I move in a little bit. I just moved in a half ball there. I'd be there normally. Now, I'm here. So now, I'm going to sweet spot that. So you can just sort of make-- play your normal swing, and it should just come out way lower. You know, that's the key-- you know, for me, that-- I feel like that's the easiest way to do it. So we've got too many guys to play in the Smackdown. So in the spirit of the state of Ne-vah-da. Nevada. I have a little idea. Tell me if you think-- if you like it because we're in Ne-vah-da. -Thank you. I think we should have a card game-- sudden death blackjack. Whoever busts gets out of the game and will have to valet the group for the rest of the day with drinks and bringing all the gear. You talk about-- you talk about sudden death. Now, that is sudden death. Either way, he is either in the show, or they're out of the show. -Makes a lot of sense. -That makes sense to me. -Who's got the deck? Where's the cards? Get me the cards. Here we go, boys. Here we go. Here we go. This is for the golf. This is for the golf. -C'mon on, big cards. I'll be staying on that. -I didn't come to lay up. Hit it again. -Whoa, you've got to do something here. -I got to hit that. -What's it going to be, whizinator? -What are you doing, whiz? CALDER CHISM: You don't mess with the Smackdown. You can't you can't go changing the rules of the Smackdown. So sorry, boys. We only got room for two of you. -Yes, that's how the cards fell. -It's the way the cookie crumbles, as we say. STEVE ELKINGTON: This is the first hole of the Secret Smackdown. Just so happens to be the number one hole of this course. Talk to me. Tell me what we're looking at. CALDER CHISM: Well, this is a short par 4. Down hill off the tee box where you find out what the old lady has got in store for you. STEVE ELKINGTON: The old lady referring to the course itself. CALDER CHISM: The course itself. STEVE ELKINGTON: So you guys pretty much represent the golf in Americana landscape here of averageness to a certain degree. CALDER CHISM: We've mastered averageness. STEVE ELKINGTON: So what we're going to do, I think, is I'm going to play you three in a scramble. You guys scramble against me. How's that sound? NARRATOR: Now on the first tee, Secret Smackdown group of El Gato, T-Money, Big C, and Elk. -C'mon, T. Get that slidey going. Milk that cow. -Ladies and gentleman, I'd like you to meet big fly. -El Gato, this is essentially, we're looking at the little push-up green right here? -Yes, no bunker on this hole. Just push-up and shallow green. Hit it the right distance. -Let's see it. 70 yards. Oh. He is here to play. -We got a chance at it. -I've detected a little change in the strategy right here. -That shot. That's a real good ball. STEVE ELKINGTON: I'm sort of sensing an opening here for me. Setting. Setting. What'd you say? Don't go long? OK, guys. So that's where you guys have got your putt from. And I'm up above the hole. -Oh, go in. Go in. -Let's see what the, uh, the old lady's going to give us here. STEVE ELKINGTON: Didn't learn much from his partner. Did not, uh, pay attention. Gato, if you miss this, you might open the door for the kangaroo. STEVE ELKINGTON: You guys played the wrong break three times in a row there after T-Money gave you the read. -Oh. Wow. The ball is square. STEVE ELKINGTON: This show is about the boys. And their love for golf is so apparent in this show and how much love they have for one another. And they just have a ball here at this course-- Washoe Golf Club. So the second hole of our Smackdown is the 14th hole here at the 'Shoe. Par five, back up the hill. -As that goes down there, the really tall tree, you hit it right there. That corner down there is Hogan's Alley. -That's where Hogan hit it down there in '51. STEVE ELKINGTON: OK, T-Money, normally speaking, you would not graduate out of my grip class because you obviously grew up on a farm, mate, because you are over there milking that thing. STEVE ELKINGTON: There's the pose. -Someone take a picture of him. STEVE ELKINGTON: He's got those old throwback 1950 Reno carpet slacks. Oh, I think we talked him out of that a little bit. Everything was good till you hit it. -A little butter cut. That's right where you want to hit it. STEVE ELKINGTON: You told me you wanted me in that corner there. -The big white cloud in between the cottonwoods, go right in between those. CALDER CHISM: If you put it in a perfect spot where Elk did, you're in great shape. If you put it in a not-perfect spot where all three of us did, you end up with a blind second shot heading up the hill to tiny push-up green. STEVE ELKINGTON: This is my chance to inject the proverbial spear into my Nevadian opponents, right here. -Oh. That's going to be butter. -Here comes the woolamaloo upper cut. -This might be the knockout. -We just got kicked in the solar plexus. STEVE ELKINGTON: I'm no expert, but I'm saying that you guys are going to have to have at least four to tie me. Wait, wait, I am an expert. -Look at this thing go. -Look at the-- look at the parachute. STEVE ELKINGTON: Man, you guys have got the short game. STEVE ELKINGTON: I am proud of you guys. That's awesome. -We hit three great chips. The amateurs decided that we would just take our good-good and run to the next hole. STEVE ELKINGTON: Let's have a showdown on the-- on the last hole. You want to? -OK, so here we are. We-- we've seen the magic, and now we're getting ready to do the real magic. Calder, you and I have worked together on 'toons for five years. A lot of people, everyone loves our 'toons. You're the meat behind the 'toons. But we're going to show people how we do it. CALDER CHISM: For the better part of five years, Elk and I have been collaborating on cartoons every single day, mostly via text message. STEVE ELKINGTON: I'll say Calder, we're going to do this. You know, I want-- I want this to happen in the-- in the 'toon. So he'll do something. And then I'll add something to it. I literally will draw in my kitchen, just draw one of his paper and take a photo of it and text it to him. -So a lot of the stuff that we do is essentially what we're doing right here right now, right? -Yeah, we just, uh, you call, we talk it out. You talk, you give me detail. I'm thinking more about the characters. And you start filling in the blanks with all the funny. You know, he's very good with all the extra detail stuff that I sort of-- my attention span starts to wander once I'm off a single character. So it's a very, very good, uh, collaboration. -His weakness is my strength, which is to-- to the, the overall theme of the 'toon. We'll see on this show where he started drawing the, the guys in the group. Then I said, go ahead and do me real big and like I'm presenting you with the arms around like that, right? So that-- that's a real combination. CALDER CHISM: And then Elk-- we got, which is I've probably drawn your mug more than anything else, ever. STEVE ELKINGTON: Well, it's OK.
-Then we both sat down in the same room and had the conversation. And worked up the whole mural for the day. And it was a blast. We just got out a big whiteboard, sat down and started scratching out the whole-- every scene, all the characters, what happened. They end up being about 200 times better than they would have been otherwise if I was just doing it. STEVE ELKINGTON: This is a devilish-looking hole here. 240 yards? The 16th hole here at the 'Shoe? -16th hole is a real beast. -This is where the cruel lady just says, you don't go in here. Get out of here. STEVE ELKINGTON: T-Money, who's got the, the cow-grip going, just sends it into the next state over, but brings it back with a three wood and puts it right behind the flag. -Oh, oh, get down. Get down. -Does the old lady like him today? STEVE ELKINGTON: Short. My worst nightmare. I've left these guys with a shot to win the Smackdown. -Johnny Cash, didn't he have a song about Reno? -Shot a man in Reno just to watch him die. -That's going to be me, I think. -Oh, man doesn't like winning. -Whoa, whoa, whoa, wait. Wh-- what we doing here? -Oh, look who is left, putting from the left. -To close out the big chief. STEVE ELKINGTON: Everything about this looks awkward. He's putting right-handed with a left-handed putter, going that way. Or that-- or is it that way? I can't tell. -Let him in. Let him in. -And there was much rejoicing with very little elevation. -Chest bump. Just the bucket hat went off. It was just-- you know, just-- it was gross, really. It was like it was rigged. STEVE ELKINGTON: This is all the ingredients we have here for the show. STEVE ELKINGTON: They're out. That's in the middle of the show. CALDER CHISM: That's the guys that lost in the blackjack match. STEVE ELKINGTON: This is the end of the show right here. CALDER CHISM: Got the end of the show. We got Elk with your covey. We got-- we got the 239 on the winning hole, the last hole. STEVE ELKINGTON: Par three. Hardest hole in the whole course. Six to eight. And then we got the cruel old lady. CALDER CHISM: When they're sprinkled around the actual footage, I think it enhances the story greatly. Adds a little bit of humor, and I get a tremendous sense of pride from it. NARRATOR: On the next episode of "Secret Golf," Elk salutes the United States Air Force. STEVE ELKINGTON: There's a lot of symbolism between golf and the rules, Air Force and the rules. Would you-- would you agree? AIRMAN: Big correlation. I'd say golf and the Academy has a lot in common. STEVE ELKINGTON: I knew that it was going to be serious. INSTRUCTOR: Why does a golf ball have dimples? -I know number two, right there. NARRATOR: Breaks a sweat, um, sort of. -It's a nice gym you guys got here. All the weights and everything, I think might mess up my swing. So I thought I'd just go in there and do a little aerobics. We call this the kangaroo. NARRATOR: Soars with the infamous falcon. -So this is Aurora. She's the official mascot of the Air Force Academy. NARRATOR: And is honored with the folding of the flag. STEVE ELKINGTON: But the one thing that stood out to me the most is how dear the flag is to them, the way they fold it and the way they hand it off. I have respect for the flag, up or down every day anyway, but this really bored it home that this-- this-- this meant a lot to me right here. That move right there. NARRATOR: "Secret Golf" with Steve Elkington has been a presentation of Secret Golf Incorporated.